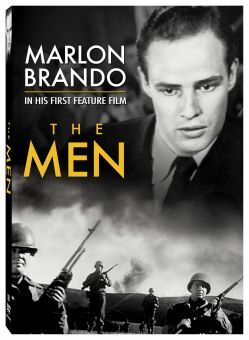 Arthur Kennedy stars as a blinded war veteran struggling to adjust to his affliction in peacetime. He must overcome his pugnacious attitude towards any problem he can't think his way out of--and he must learn to temper his inbred racial prejudices. Peggy Dow plays the woman who loves Kennedy enough to be cruel to him during his bouts of self-pity. 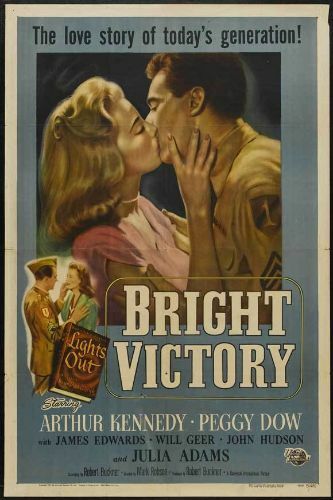 Refusing to lapse into sentimentality, Bright Victory, based on the novel by Bayard Kendrick, is one of the best of the "against all odds" films of the 1950s. Arthur Kennedy's performance won him the New York Critics' Circle award, but not the Oscar he so richly deserved. 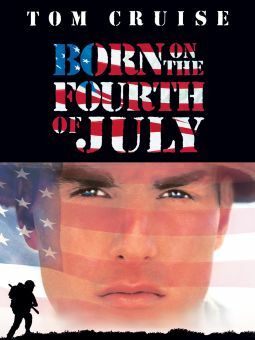 Trivia note: new Universal contractee Rock Hudson receives 18th billing for his bit role as a soldier in this film.